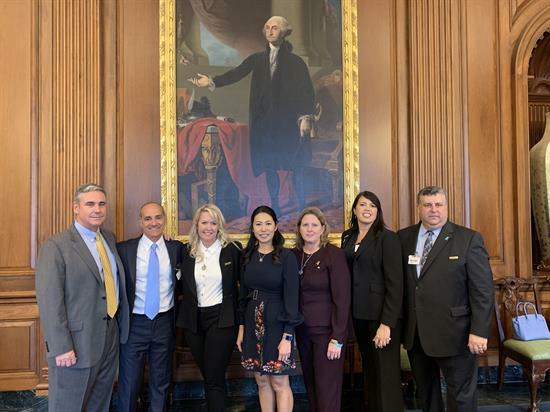 WASHINGTON— Less than a week before the anniversary of the tragic shooting at Marjory Stoneman Douglas High School in Parkland, Fla., Congresswoman Stephanie Murphy met with Stand with Parkland, a national organization founded by families of students and teachers killed in the shooting. In their meeting, they discussed the urgent need to take action to end gun violence and called for passage of the bipartisan Background Checks Act, which Murphy has cosponsored. The bill would implement the commonsense approach supported by most Americans to require that every sale of a firearm include a background check. The House is expected to bring this bill to the floor for a vote this month. Meeting included President of Stand with Parkland Tony Montalto, Jennifer Montalto, April Schentrup, Debbi Hixon, and Tom and Gina Hoyer. “I’m grateful for this chance to meet with the parents of the Parkland shooting victims, to hear their stories, and to stand with them in their courageous fight against gun violence. No parent wants to send their kids to school, church, or a movie theater worried that they may not come home. Here in central Florida, we know all too well the pain inflicted by gun violence, and that’s why I’ve been working to end it since I first came to Congress two years ago. I will keep fighting to protect our children and our communities, and I look forward to standing with Parkland as I proudly cast a vote to keep dangerous weapons away from dangerous individuals,” said Murphy. More than 17,000 children and teens are injured or killed from gun violence each year. On average, 34 people in America are murdered in acts of gun violence every single day. Last year, Murphy successfully passed bipartisan legislation into law that essentially repeals the two-decade-old Dickey Amendment, paving the way for the Centers for Disease Control and Prevention (CDC) to sponsor evidence-based research into ways to reduce gun violence.